A World War I memorial, which was thought to have been destroyed in a fire at a Northumberland school almost 40 years ago, has been returned after being found in the Netherlands. The stonework mosaic plaque bears the names of former pupils and staff of Whitley First School in Bedlington who died in WWI. 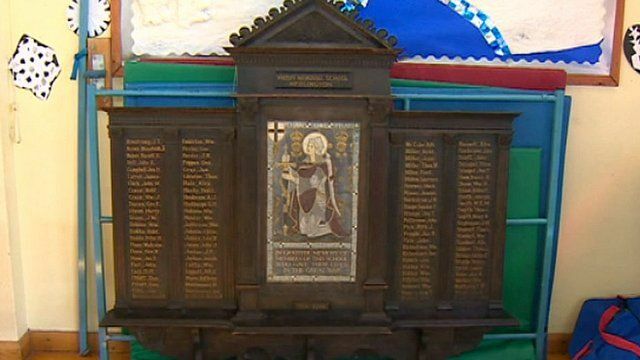 A Dutch family had bought the 6ft (1.8m) wide plaque from an antiques dealer and subsequently came across the story about the school's "lost" memorial on the internet. Photographs of the plaque were emailed to the school and checked with names at the local church.